Everton prodigy Wayne Rooney came off the bench to dominate proceedings at Fratton Park. When he arrived on the pitch midway through the first half Everton were trailing to Jason Roberts' first goal for Portsmouth, but within a couple of minutes the visitors had drawn level through Lee Carsley. Just before the break Rooney pounced to put Everton 2-1 ahead, and he was involved in a bizarre second-half incident. After pushing over Steve Stone, Rooney walked off the pitch, apparently thinking he had been sent off, but he had only been booked and was recalled to play out the rest of the match. The win saw Everton leap-frog Portsmouth, who are now just one place above the drop zone having lost eight of their last 11 Premiership matches. Portsmouth were out of the blocks quickest and they took the lead when Teddy Sheringham picked out Roberts with a fine pass. The on-loan striker, back after missing five games with an ankle injury, found himself with a clear sight of goal and he finished from 12 yards to register his first Premiership strike. 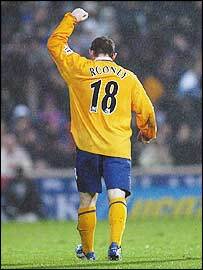 Within 10 minutes Rooney entered the action in place of the injured Watson and Everton were soon level, with Carsley turning in Kevin Kilbane's cross. Tomas Radzinski then wasted a good chance for Everton after an error by Hayden Foxe but Rooney was not so generous. The 18-year-old had only scored once for Everton this season and he doubled his tally after Pavel Srnicek could only palm Gary Naysmith's cross into his path at the far post. The England star fired in a blistering shot and although Srnicek got a hand to it he could not prevent it flying into the net. Rooney's goal will hopefully give him the confidence to play like the "old" Wayne (flippin' eck, he's 18 and I'm saying things like that). Everton nearly added to their lead soon after the break as Srnicek fumbled Kilbane's drive round the post, before Radzinski just failed to force the ball home after Rooney sent the ball goalwards. But then, with 20 minutes remaining, came the strange incident surrounding Rooney as he walked off the pitch after pushing over Steve Stone. It looked as though he had been sent off but the teenager had only been booked and he returned to the action to play out the remainder of the match. Portsmouth tried to get back on level terms, with substitute Vincent Pericard and Roberts both testing Everton keeper Nigel Martyn, but the visitors held out to take three vital points. Portsmouth: Srnicek, Taylor, Foxe, Zivkovic, Stefanovic, Smertin, Sheringham (Pericard 79), Faye, Stone, Roberts, Ayegbini. Subs not used: Wapenaar, Primus, Sherwood, O'Neil. Everton: Martyn, Pistone, Stubbs, Unsworth, Naysmith, Watson (Rooney 24), Carsley, Gravesen, Kilbane, Radzinski (McFadden 84), Campbell. Subs not used: Simonsen, Jeffers, Li Tie. "We deserved to win, we were better than Portsmouth"